The other day I was hanging out with my daughter and she asked if she could paint something. Now, I could’ve gotten out the craft paint and the paper (and boy, do we have a lot of both), but for some reason that didn’t appeal. So I decided to bake cookies. How do these two things relate, you ask? 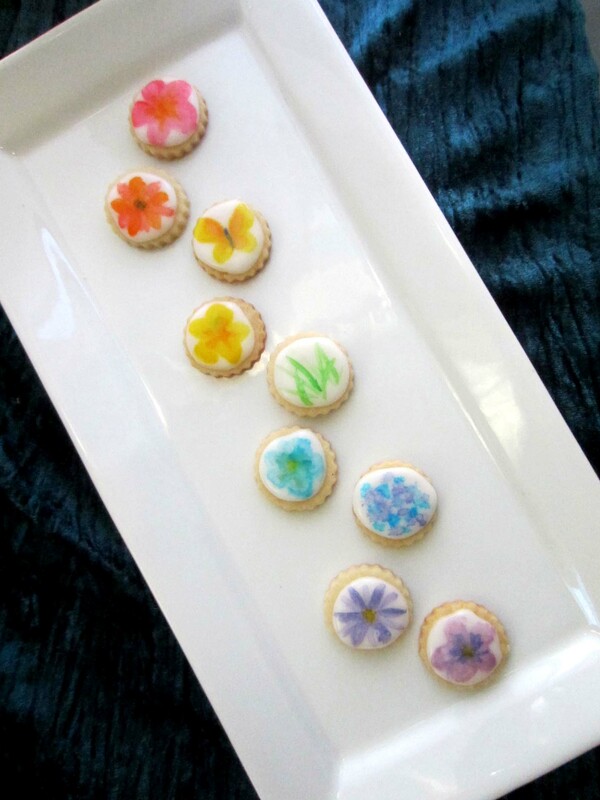 Why, we were going to paint on the cookies, of course! First up was baking a basic sugar cookie cutout. My favorite recipe mixes up quickly, needs no chilling before rolling and cutting, hardly spreads at all in the oven, and tastes fantastic. 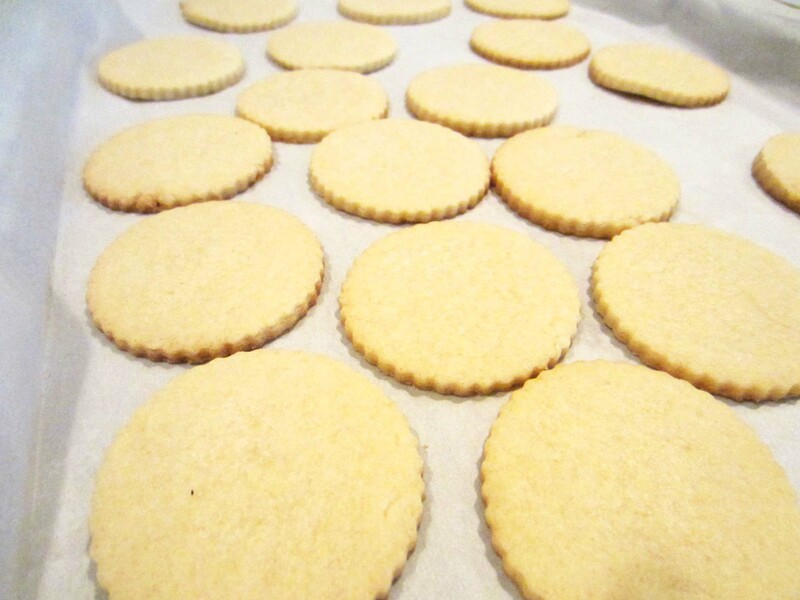 You can also freeze the baked (unfrosted) cookies for weeks and thaw them back out with no effect on quality. Cream together the butter and sugar until fully combined– not light and fluffy. You want to avoid incorporating too much air. Add the egg and vanilla and incorporate fully. In a separate bowl, mix together the dry ingredients, then add it in three parts to the butter mixture, mixing slowly to form dough. Roll out dough 1/4″ thick, cut, and freeze the cutouts about 15-30 minutes for best shape-holding in the oven. Once frozen, bake at 350 degrees on parchment or foil for 10-12 minutes. If they are slightly golden around the edges, they are done, but you can probably take them out about a minute before that if you prefer them paler. 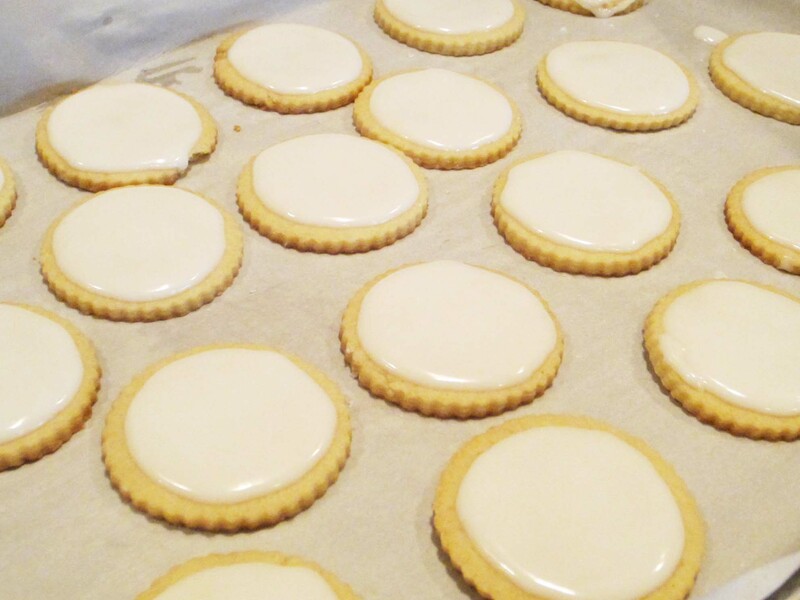 Once baked and completely cooled, I frosted the cookies with white glaze icing. I don’t like royal icing for the simple reason that it tastes terrible and is tooth-crackingly hard. Glaze, on the other hand, dries just as smooth and pretty (though not as dimensional for those who want 3D decorations), tastes much better, and won’t crack your dental work– definitely preferable. Mix all ingredients together, using only 1/4 cup water, until smooth. Keep adding water about 1 tsp at a time until the icing flows nicely. ** For this application– a nice smooth surface with no icing decorations– you want it to follow the “10 second rule,” which means that if you pull your spoon up from the surface of the icing (making a little peak or whatever), the icing will flow back into a completely smooth surface in 10 seconds. You may want to make it more of a 7-8 second rule if your hands tire easily– piping a full recipe’s worth of cookies gave me some serious hand cramps with 10-second icing. * The white gel coloring is definitely necessary for this application; otherwise the icing will be kind of translucent and you won’t have a nice white surface for painting on. It’s not necessary if you’re going to color the icing for other decorating ideas, but it does help the colors look brighter and more opaque. **If you’re going to color your icing, do it before you adjust the consistency– the food coloring can change the texture of your icing a lot. Okay, so now that you’ve got your baked cookies and your glaze icing, spoon the icing into a piping bag fitted with a #3 round tip and cover the surface of your cookies. I generally trace a circle around the outside, zig-zag around in the middle for a while, then use the tip of the piping bag to swirl the piped icing around inside the outline so it fills in all the blank spots– I squeeze a bit more icing in here and there if it’s not covering well enough. Then put the cookie down and let it all smooth out. If you want that nice smooth surface you’ll need to get the cookie fully covered in this first shot– you won’t be able to come back later and fill in edges without it showing a seam. You could also probably just dip the cookies face-down into the glaze if you don’t have a piping bag. Let the cookies dry overnight– I let mine sit for about 18 hours before painting. To paint, I dipped the very tip of my brush (I’m using a number 1 round brush that cost me all of 54 cents at the art store) into the vodka, then pulled a teeny, tiny amount of gel coloring into the bottom of the well of the palette. I mixed it around a bit with the vodka until it formed paint, adding more vodka as necessary to dilute it to the correct shade to paint with. After I finished painting with that color, I swished the brush through my cleaning water, blotted it on the paper towel, then repeated the process with another color. Using the vodka ensures that your icing doesn’t get too soggy as you paint on top of it, and rinsing with a separate glass of water prevents your vodka from taking on residual colors as you paint. Don’t worry if your “paint” dries out between uses for each cookie– vodka’s quick evaporation rate is the whole reason you’re using it. Just dip your brush in more vodka and moisten up the paint again to use it. 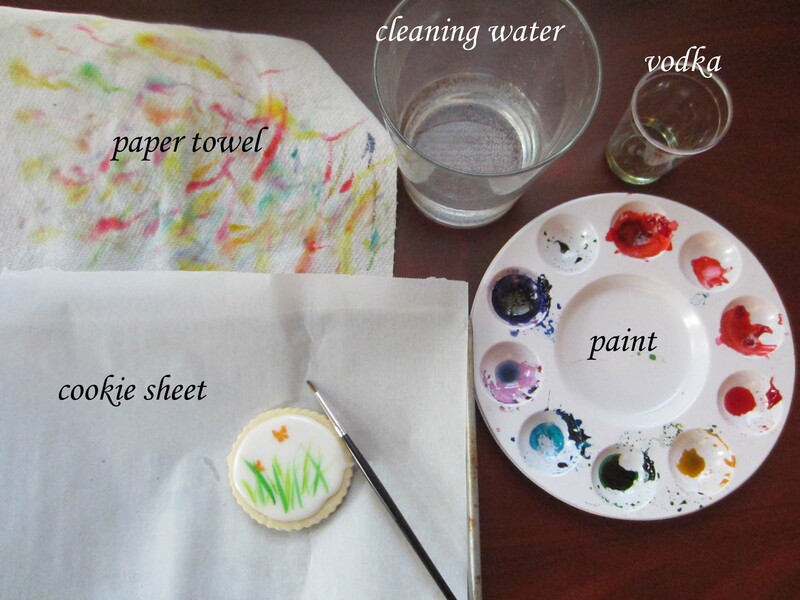 You can treat these paints just like any other watercolor in terms of mixing, blending, etc. I thought I was going to use my food coloring markers to bring out small details in the finished paintings, but I ended up liking the soft look of paint only. Seriously in love with these cookies– I just want to keep taking pictures of them, and certainly can’t bring myself to eat them! 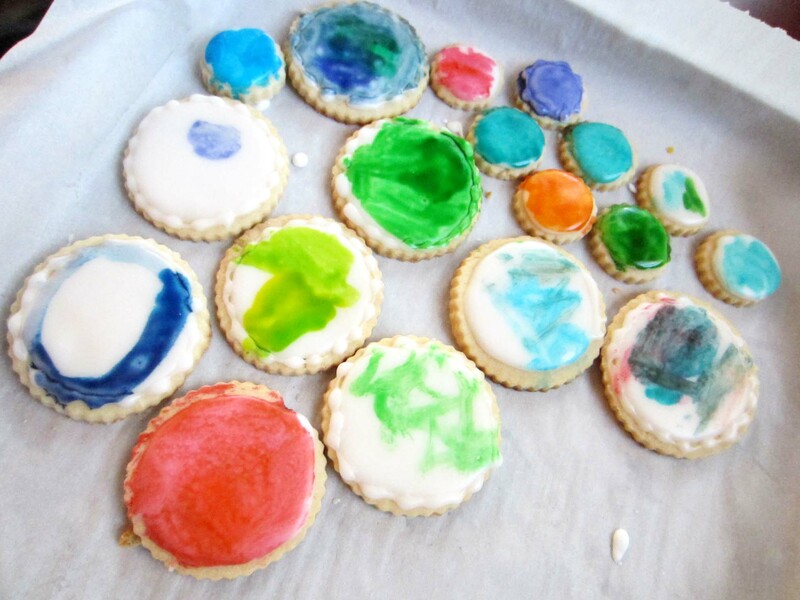 As for my daughter, she painted her own cookies (after I pre-mixed some paint for her– she wasn’t big on the multistep “dip, mix, paint, rinse, blot” process). For about two minutes. Then she turned to me and said indifferently, “can you do the rest?” TWO MINUTES. That’s how long it took for her to get bored. Bored! 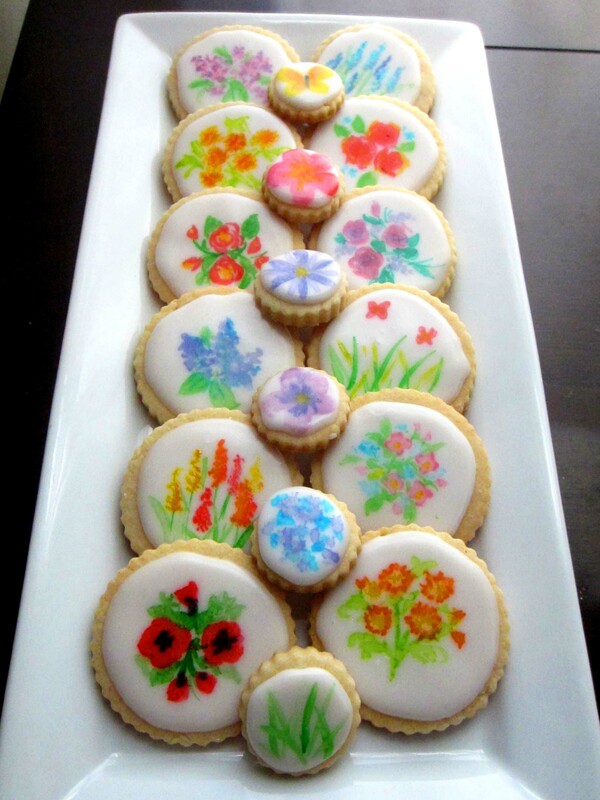 With painting cookies! Whoever heard of such a thing? I prodded her into painting some more later in the evening (mostly by conditioning her eating any of the cookies on her painting the rest of them), and here they are! 1. While the entire glaze icing recipe above will technically fit into a 12″ disposable piping bag, I wouldn’t recommend it– it’ll be too full and will be a lot more trouble to pipe out. Either get a larger bag or only put in half the glaze and cover the other half with a damp paper towel until you need it. 2. Do use a round piping tip in your bag, rather than just snipping off the end. You may not think you need it since you’re not actually making any detailed decorations, but it’ll make it a lot easier to control the flow of your icing and get the edges exactly where you want them. I use a #3 but you could go a bit bigger if you like– definitely no smaller or it’ll take forever to squeeze out enough icing and your hands will hurt. 3. 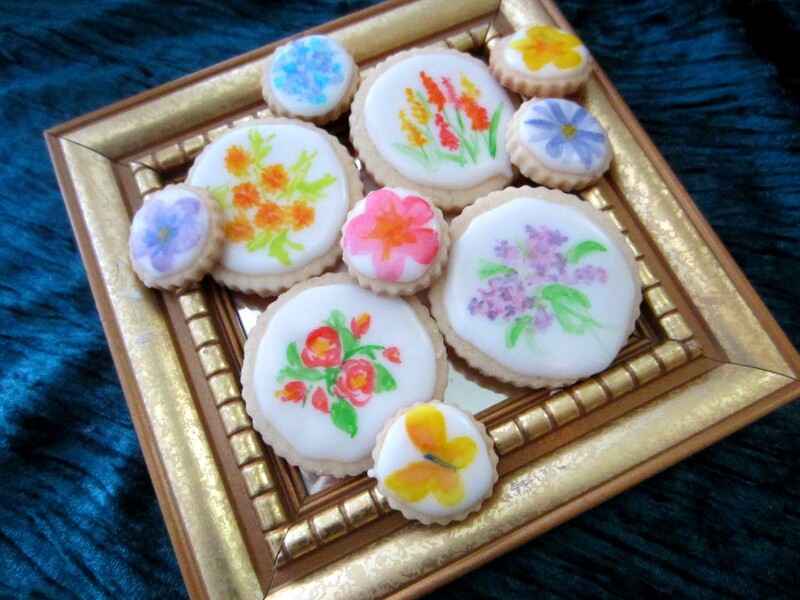 I did all of the above paintings with that number 1 round brush I mentioned– if I’d been intending to write anything on the cookies I’d have used a size 0 brush, and for any larger areas of paint I’d have gone up to a 2 or 3, but no higher than that. Make sure your brushes are small enough– watercolor tends to spread a lot as you paint. 4. The amount of vodka you mix into your color will not only affect the shade of your paint but also the consistency. If you want smaller details make sure your paint is relatively dry (if necessary, dilute and then let the paint sit for a bit to evaporate and get drier), or else it will just spread out no matter how small your brush is. Similarly, if you want to layer colors without having them blend too much, let the bottom layer dry for a minute before adding your next color, so they stay distinct. 5. I wouldn’t recommend doing this too often, but if you mess up you can always put a little plain vodka on your brush and use it to remove most of the color from a bad spot. The problem is that if you use too much it’ll take off the very top layer of your glaze icing, which is the nice smooth part, so be careful! I’ve never tried glaze icing before and to be honest not that good with royal icing either. I will try this glaze icing. Thank you so much.